Everton Ladies are set to rejoin the top tier of the Women's Super League in 2017-18, after the Football Association named them as their preferred bidder to replace Notts County Ladies in WSL 1. WSL 2 clubs were invited to apply to replace Notts, who folded in April. 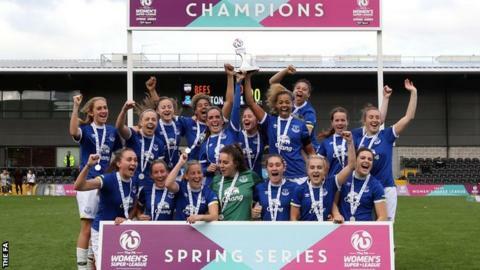 Everton finished top of the WSL 2 Spring Series in May, but no promotions were scheduled between the divisions. Doncaster Rovers Belles were the only other club to apply and have seven days to appeal against the decision. The FA's decision will be ratified at the league's annual general meeting on 28 June. The Belles, who finished second behind Everton, had expressed "disappointment" regarding the application process, claiming the FA was looking for a "particular type of club". The 'rebalancing' of the two WSL tiers will see 10 teams in WSL 1 and 10 teams in WSL 2 for 2017-18, which will be the first winter season since the competition switched away from a summer calendar in 2011. Everton are one of four second-tier clubs who are affiliated with a men's Premier League side, along with Brighton, Watford, and promoted Tottenham. Andy Spence's Toffees won seven of their nine league games in the Spring Series, finishing four points clear of the Belles in the table. Everton were originally founding members of the WSL, playing in the top flight from its formation in 2011 until they were relegated in 2014. They had narrowly missed out on promotion back to WSL 1 in 2016, having also finished third the previous year. "We knew it was a possibility that we could be promoted but to have it confirmed is welcome news," Everton's general manager Aaron Little told the club website. "For the past number of weeks we have been planning for both scenarios in terms of player recruitment and retention. "We are under no illusions how tough it will be. The standard of football within the women's game is increasing year on year but we are ready to make our mark." A statement from the Belles said: "We put forward a strong application and are naturally disappointed not to have been promoted by way of application. "But we will now concentrate on winning promotion through the league, as we have done in the past. "We now have seven days to consider whether we appeal, and understand that we will be receiving a letter of explanation, whereupon the club's legal team will review the same and recommend a course of action. "We would like to offer our congratulations to Everton Ladies, who showed in the Spring Series that they are ready for WSL 1."